Simplicity's challenge yesterday was a hard one! The challenge is to make a one layer card in black and white, adding just a hint of color to make it pop. I really wish I had more time this week to dig into my stamps a bit to see what I could come up with, but the rest of this week and most of next is completely booked. 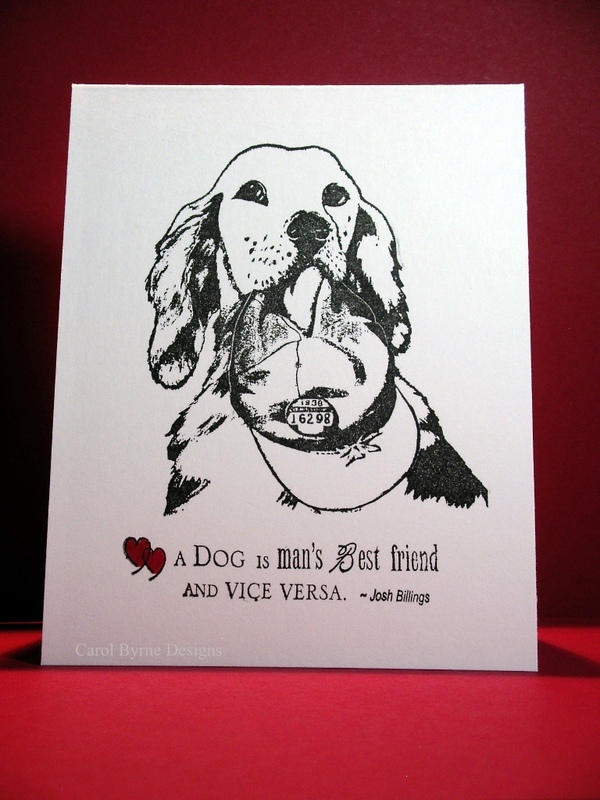 So, I chose my animal and dog stamp drawers and came up with these two cards. First up is a really fun cat stamp by Rubber Soul. The complementary sentiment is from Inky Antics. This second card uses a lab stamp from Cornish Heritage Farms and the sentiment is by Cloud 9. I stamped this image in sepia on cream cardstock the first time I used it a while back and colored the hat a denim-y color...turned out really nice....I think I like that one better than this one. But, this one's not bad. Leave it to you to come up with not one, but two awesome creations for Susan's challenge. My favorite is the cats, of course *wink* Great job, gf. And your pictures are fabulous! Hi! I love your cat one too. Great job on the challenge! SUCH cute cards! And you made them look complete, despite not being able to add colors. Love your cards, Carol! The cats are purr-fectly wonderful! I'm not usually a "cat" person, but that first card is absolutely adorable!! I love the second card too. You're very industrious too...I barely got one card finished! 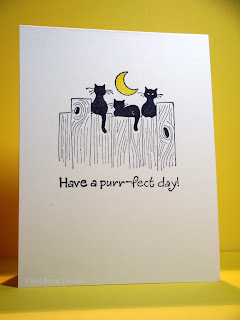 Since I'm a cat person, I just LOVE your cat card! They are both cute as can be! These are both fab Carol, I love the imagery on both. And they look fantastic in B&W with the spot of colour. I love these! The cat one is especially adorable!